Peter J. Bentley, Ph.D. is an Honorary Senior Research Fellow at the Department of Computer Science, University College London (UCL), Collaborating Professor at the Korean Advanced Institute for Science and Technology (KAIST), a Visiting Research Fellow of the University of Kent, and a freelance writer. Peter runs the Digital Biology Interest Group at UCL and is known for his prolific research covering all aspects of Evolutionary Computation and Digital Biology. His research investigates evolutionary algorithms, computational development, artificial immune systems, swarming systems and other complex systems, applied to diverse applications including design, control, novel robotics, nanotechnology, fraud detection, security, art, and music composition. Peter was nominated for the $100,000 Edge of Computation Prize in 2005. He regularly gives plenary speeches at international conferences and is a consultant, convenor, chair and reviewer for workshops, conferences, journals and books in the field of evolutionary computation and complex systems. He has published over 160 scientific papers and is editor of the books Evolutionary Design by Computers, Creative Evolutionary Systems, and On Growth, Form, and Computers, and author of The PhD Application Handbook and the popular science books Digital Biology, The Book of Numbers: The Secret of Numbers and How They Changed the World, and The Undercover Scientist: The Science of Mishaps. His scientific papers include Crash-Proof Systemic Computing: A Demonstration of Native Fault-Tolerance and Self-Maintenance, Mapping Virtual Self-assembly Rules to Physical Systems, A Systemic Computation Platform for the Modelling and Analysis of Processes with Natural Characteristics, Investigating the Emergence of Multicellularity Using a Population of Neural Network Agents, Working Towards Self-Assembling Robots at all Scales, Programming Nanotechnology: Learning from Nature, Everything Computes, and Investigations into Graceful Degradation of Evolutionary Developmental Software. Peter earned a Ph.D. in evolutionary design with the thesis Generic Evolutionary Design of Solid Objects using a Genetic Algorithm and has received international recognition for his work on evolutionary computation. On July 9, 2007, he chaired the GECCO debate on evolution and complexity at the Natural History Museum, organized with panelists Richard Dawkins, Steve Jones, and Lewis Wolpert. Watch this debate! Listen to him on the 30 minute BBC Radio 4 documentary, Natural Technology and listen to his Austrian radio interview. Read the transcript of his interview by Robyn Williams for ABC National Radio, titled Evolving Robots. Read Evolutionary Activity. 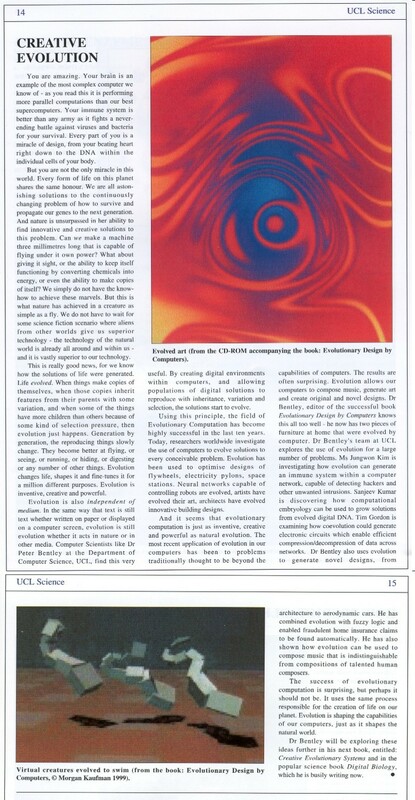 Can digital biology help to create truly intelligent electronic devices?, Creative Evolution, Is Life the Key to New Tech?, The Garden Where Perfect Software Grows, Robot spy can survive battlefield damage, Virtual car racing triumph, Inspired by Immunity, and Cutting Edge feature: Digital Darwinism. Learn about all his media coverage.